I was just reading the comments from my last post, and realized that my dear friend Linzmoe is right. Being able to appreciate the small things in life is what really keeps me happy. Coincidentally, I happened to be eating my lunch at the time I was reading Linzmoe’s comment. Today I chose to indulge (a post-summer school celebration, if you will) and drive downtown to get a baguette and a chocolate crepe from The French Market. The owners actually go to France at least once a year (maybe more) to stock up on authentic French stuff to sell back in Knoxville. And the crepes they make are to die for. I would show you a photo of the chocolate crepe I got, but I ate it in a most unladylike manner while driving back to work. 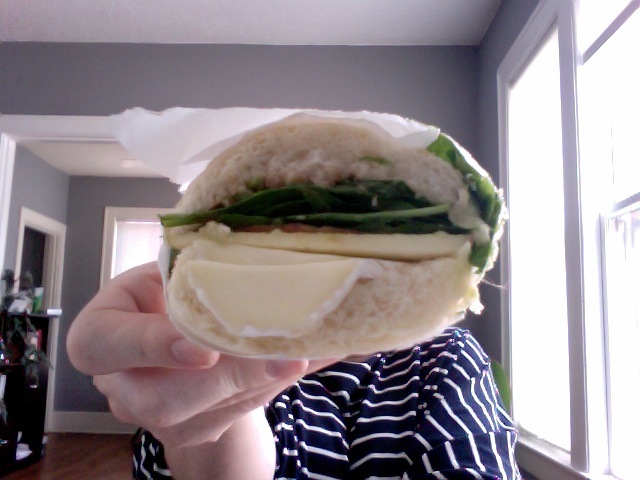 Here are some photos of the baguette I got for lunch (yes, that is a giant piece of brie cheese sticking out of it, and also, stop drooling, it’s unbecoming) and me eating said baguette. Ooooh, how I love the little things. The fresh, delicious, cheese-filled, honey covered little things. OM NOM! 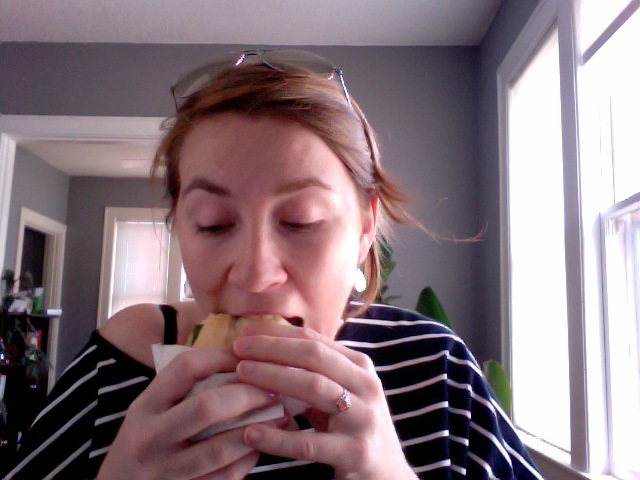 Me eating said baguette. I'm pretty sure you're jealous right now. It's okay. Also, how French do I look right now? Those stripes? Ooh lala!